27 April 1944. RAF Lancaster PG-S left Lincolnshire on a raid to Germany but failed to return. Navigating the flight was Warrant Officer James Chandler Horne, RCAF. By Name Alone is the result of a very personal research project to discover who my uncle was, and how I could share that story with my son, this generation's Jimmy Horne. Uncle Jimmy was always a revered name in our house and though I was well aware of his importance to my father, we never sat down and discussed his brothers short life for any length of time. Regretably, it was not until the death of my father that I understood how important it was to me to be able to pass on to my own son Jimmy the amazing story of his great uncle. 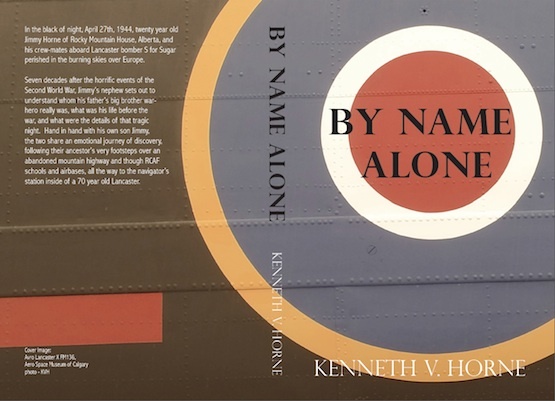 This web page then is a small distillation of that story, but it is also a place on the internet where I can post the names and places of his squadron and crewmates from the Second World War. I certainly hope that someone else with a connection to my uncle's squadron or crew will trip over this site and contact me. I would love to hear from any of you. Tommy Graham, Jack Watson, Jimmy Horne, Bob Whinfield, Don Chick, George Langridge, Harry Goldberg. Avro Lancaster GP-W (ED437), RAF Winthorpe, Newark Nottinghamshire, December 22nd 1943. 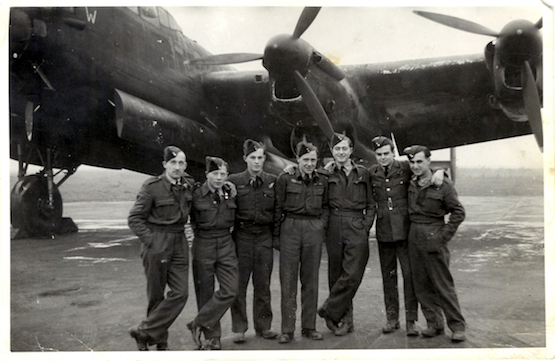 This photo was taken upon landing their first solo flight in an Avro Lancaster. This crew, led by pilot Bob Whinfield, would be the crew that perished on the night of 27 April 1944 with the addition of Reginald Wickham who replaced Graham. Second pilot Francis Saxton Young, on his first training flight, escaped and parachuted to the relative safety of a POW camp. Welcome to the The Spitfire Project. This page is to be a resource for the the Solid Model Memories group. We are a group of carvers who still practice the nearly forgotten art of carving Solid or Shelf models in much the same fashion as was practiced primarily in the 1930's and 40's. This is the Spitfire Project Topic Heading if you want to follow the discussion so far. Follow this link to see Pictures. For those of you interested but not yet a member of our merry band, I say give it a whirl. 1:48 scale models of K-5054, the "First of the Few"
The gang of us have had a couple of "Cook-Up" style builds in the past and there are a couple who now seem interested in some sort of "Semi-Unofficial-Style" Spitfire Cook-Up to celebrate the 70th anniversary of the first flight of the prototype K-5054. At the moment there seems to be some interest in building odd-ball types or even pre-prototype or abandoned types. We are a real "to-each-his-own" group, so I'd suggest that if you build it we will applaud. Below can be found some plans from which to begin your research. Though it's true that you can never have too much information, you'll also find below a one stop shop from which an absolute beginner will find everything needed to build a nice model. The Spitfire is a perfect first solid for anyone who would like to try their hand at it. This page will be updated from time to time as more documents, or your model photos are submitted. The US Navy Bureau of Aeronautics developed a beautiful set of plans and instructions in the hopes of having school boys carve out 500,000 Spotter Models for use by the military. If you follow these simple instructions and plans I GUARENTEE that you will complete a beautiful model, first time out! Even those of you who have built Solids in the past will enjoy looking through these instructions. Here are a few drawings that can be used as the basis for your Spitfire build. WANTED: Any plans, drawings, links or info that you would be willing to share to the project. William Wylam drew the nicest plans from the Golden Era. Perhaps more accurate plans have been rendered since this set first appeared in the February 1941 issue of Model Airplane News, but for nostalgic sake, nothing can beat Wylam. The following set includes some pre-prototype versions, interesting to see the design development. Spitfire III with Roc-type floats and enlarged fin and rudder, late 1940. The main source drawing for my prototype, K-5054 models. The Speed Spitfire, found on Modeler's Resource Air Racers 1919-1939 page.